New Year’s Eve has dawned wet, gray, and cool but today’s weather should only improve from here as a modest cool front moves through and brings westerly winds to dry the region out. 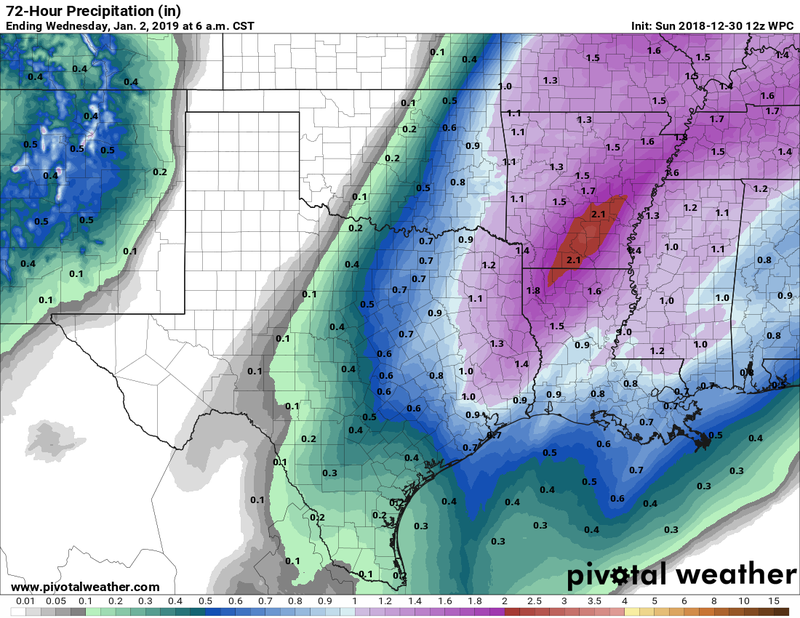 It appears as though we’ll see one more bout of rainfall during the mid-week period before a longer spell of drier weather settles over the region. Is anyone else tired of gray skies and on-again, off-again rain showers? Rain showers are ending from west to east, and should exit the area entirely by around 10am. We may see a few visits from the Sun later today, but skies will likely remain mostly cloudy this afternoon as temperatures rise into the low-60s. Fortunately, this front isn’t too strong, so we’re not going to see blustery conditions later today and tonight. In fact, as the sun sets this evening, winds should die down with it. Therefore, for festivities tonight, we can expect partly cloudy skies, temperatures near 50 degrees, and generally pleasant conditions. Please celebrate responsibly! We took advantage of a slow Sunday morning to move Space City Weather to a new server, which should load even faster than before, and which should allow us to weather any traffic spikes during major storms. 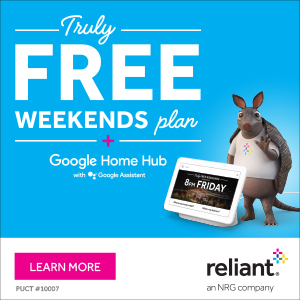 We were able to make this significant investment thanks to the generosity of our readers during last month’s fundraiser, as well as Reliant’s ongoing support. Please, if you notice any problems, use the feedback form to let us know. (More server specs in a minute). As for the New Year’s Eve forecast, it’s more or less on track. Above a small envelope of cool air at the surface, moisture from the Gulf of Mexico is streaming into the atmosphere above the upper Texas coast. The net effect of this is going to be on-again, off-again, light to moderate rainfall on Sunday, Sunday night, and Monday morning. Most of the region should see 1 inch or less of rain, so we don’t anticipate any problems. Fortunately, the rainfall should end by or before noon on New Year’s Eve, and we could see partly sunny skies with highs in the low 60s later in the day. As for the countdown to midnight, we expect partially clearing skies, with temperatures around 50 degrees and light winds. All in all, this is fairly good weather for New Year’s Eve festivities, so enjoy the celebrations. Space City Weather is now running on its own dedicated server, with no co-tenants and no sharing of anything. The box is a quad-core Intel Xeon E3-1230 with 16GB of RAM and dual 480GB SSDs in a RAID1 mirror, connected to the Internet via a dedicated 1Gbps uplink. We have plenty of room to grow and should be reasonably future-proof for at least the next several years. Thanks again to all of our readers who supported us, and shared our site in 2018. We promise to deliver more of the same next year, with a site re-design and flood scale coming in the near future. We always seem to lock into a dreary, gray pattern this time of year for a period of time, and this year, while a bit more broken up, looks similar. So enjoy today, which will be delightful! Beautiful. Expect sunshine and really stunning weather for late December. We’ll do lower 60s this afternoon, with a few spots maybe in the upper-50s. Other than a modest breeze and perhaps a few clouds late, it will be a calm, lovely day. We’ll be setting up another storm system over the area beginning tonight. While this one should not have nearly the impact of the storm we just got through, it will be a bit drawn out. Clouds will increase tonight, with low temperatures probably being reached earlier in the evening than Thursday night into this morning. 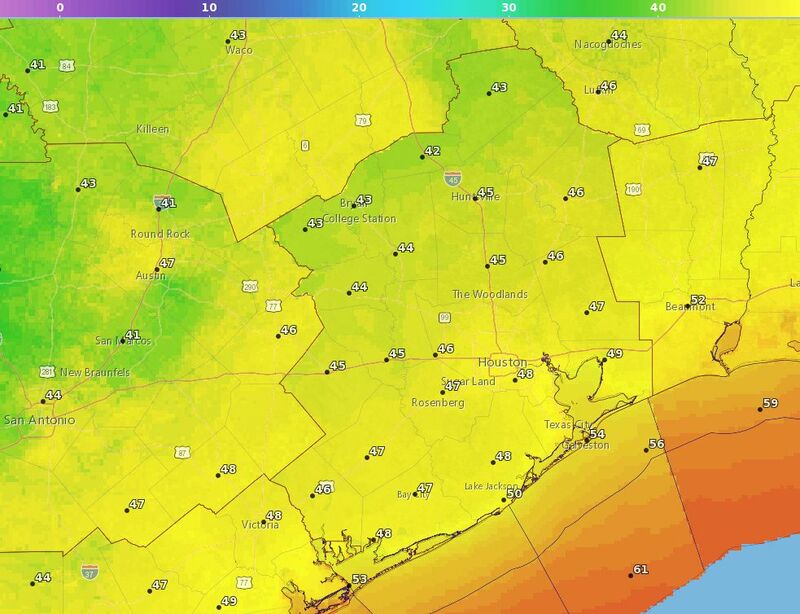 We should do mid- to upper-40s for lows. Unfortunately, Saturday doesn’t look great. I’m hesitant to call it a washout right now, but I do think there will be a fair bit of light or steady rain and showers around during much of Saturday. Moisture begins to increase tonight, and it will further increase tomorrow and tomorrow night. Rain chances will probably start near the coast on Saturday morning and spread inland during the afternoon and evening. Good morning! The worst of Wednesday night’s and Thursday’s morning’s thunderstorms are now moving eastward, and the remainder of the storms should be off the coast by around 10 or 11am this morning. 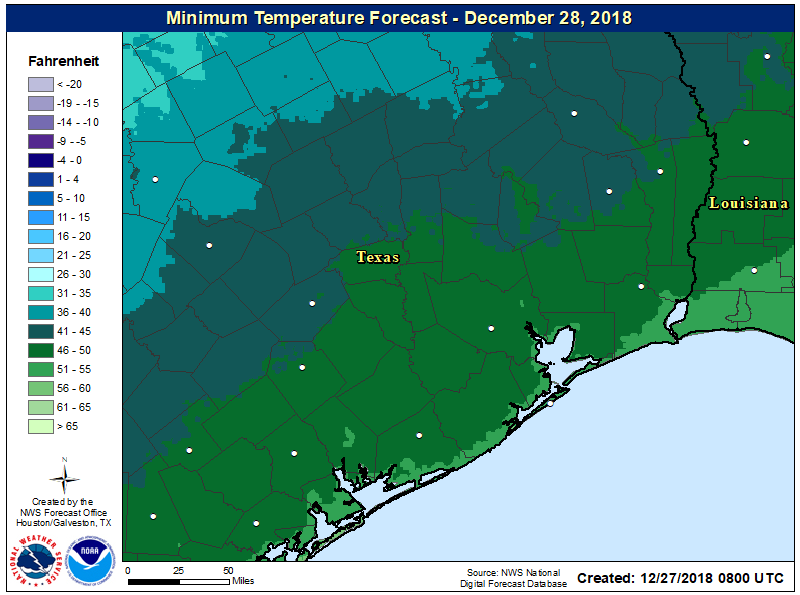 After several days of 70-degree weather, winter should now feel more like winter in the greater Houston area. Storms on Wednesday and Thursday brought a healthy amount of rain, with 1-3 inches generally, and a few reports of damaging winds. This morning, there are a few high-water sites on area roadways, but for the most part no major concerns. Temperatures have fallen into the mid-50s as the front moves through, and as rains end later this morning, we should see some clearing skies later this afternoon that will allow highs to get up to about 70 degrees. Lows tonight should drop down to about 50 degrees. This still looks to be the pick of the litter for this week, and perhaps next as well. Look for highs in the mid-60s, with mostly sunny skies, and light winds. This will probably be the last time we really see the Sun in 2018.